Socks is understating it. I met Nancy Johnston, founder of Tengri, recently and was blown away by the way a hyper-luxury brand could be created on such benevolent, even altruistic, principles. Not only has Tengri set the benchmark for sustainability in fashion, they also make the most exquisite yarns and products from, believe it or not, yak hair. £95/pair. For more information and full product range, visit www.tengri.co.uk. So, your cousin/sibling/friend claims to be the definitive gin aficionado, annoyingly usurping your order for a Hendricks and cucumber by listing the botanicals and appropriate garnish in almost every unheard-of bottle on display at the bar back. What you need is a retort as rapier-like as Ryan Reynolds’. Why not use the actor’s own? Aviation is the Reynolds’ own brand, and it’s different from all the others doing the rounds in that it’s American. And if you want a laugh while you’re about it, watch his launch video with Richard Branson for their Virgin Atlantic partnership. Available at selected stockists. For more info, visit www.aviationgin.com. Personally, I’d call it catnip for humans – absolutely irresistible. They have a Colonia Artist Edition, designed by British artist Clym Evernden, out for Christmas and “hatbox sets” that include the eau de cologne, shower gel and deodorant spray. Available at leading department stores. For more info, visit www.acquadiparma.com. These days we’re told people want to be given experiences not things, so they can brag on Instagram about how fabulous their life is. I’m not sure what Pieter Bruegel would have thought of this (probably not much), but the chance to see most of his great arts in one place is too good to miss. Therefore, I recommend you buy you and your loved one return flights to Vienna and tickets to the ‘Once in a Lifetime’ exhibition at the Kunsthistorisches Museum. The riches on display are so numerous and so engrossing; so enigmatic, so life-affirming and so terrifying I could have spent all day here. The Hunters in the Snow held me spellbound for at least half an hour and that’s just the start of it. If you buy a ticket you won’t regret it and as the title says, it really is a once in a lifetime chance. You’ll have to hurry though, as the exhibition finishes on the 13th January (unlucky for those who miss out), but there’s no better way to liven up early January. Don’t hesitate! For more information, visit www.bruegel2018.at. If you would like to gift something more corporeal I’d urge you to buy the wine lover in your life membership of The Wine Society. 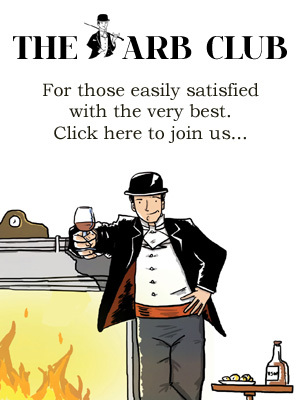 This venerable institution is run solely for its members’ benefit and their buyers are almost unmatched in their ability to unearth top quality, good value wine from all four quarters of the globe. A lifetime membership costs £40 (with £20 off the recipient’s first order) but if you were feeling particularly generous you might also stump up for a year’s subscription to one of their vintage cellar plans, which start from £28 per month. I’ve subscribed to their Rising Stars plan for the last eight years and have built up a collection of more than 150 bottles in their warehouse in Stevenage for not much more than the cost of a round of drinks every month. For more information and membership, visit www.thewinesociety.com. Christmas being a gargantuan application of meat and roasted root vegetables, the obvious gift to bequeath to your loved one this time of year is more meat. But not just any meat; Cinco Jotas iberico ham. Because who knows what’ll happen next year; Britain’s Brexit ambitions might make the transit of weapons-grade meat untenable. So, stock up on the good stuff while you can. Cinco Jotas is so melt-in-your-mouth delectable that it’s the weapon of choice of José Pizarro. Even better, the apocryphal top boffins have decreed that good quality iberico has the right mix of oleic acid and omega 9 to be as healthy as it is luxuriant. The beautifully packaged Discovery Gift Box is not a bad way to start at £60, but let’s not settle for ‘not bad’. How about the Celebration Gift Set: an entire bone-in ham to carve yourself, half a loin, an eye-wateringly sharp Arcos professional carving knife to do the deed, and a printed guide to carving like a pro. So, this Christmas, say it with meat. The Celebration Gift Set, £639, from cinco jotas. Canton are no stranger to the luxury market, operating as chief supplier to many a high-end hotel and Michelin-starred eaterie, so much so they’ve partnered with Piccadilly’s finest, The Wolseley, to create a bespoke collection of caddies. The exclusively created range offers pyramid teabags inside unique tea caddies, designed with an elegant Chinoiserie motif, evocative of the interior of The Wolseley itself, and a selection of loose teas in Tin Gift Sets. Choose from Assam, Yunnan Green or Jasmine Bud, unwrapping one of these will leaf (geddit?) your recipient in a flutter. Caddies start at £14.95 for 20 teabags, available from thewolseleyshop.com, the flagship store and selected stockists. A just-released single malt the colour of sunset. The smokiness might bring autumn bonfires to mind, but the smell of lightly charred clementines? That’s pure Christmas. £53 from Isle of Raasay Distillery. For more information, visit www.raasaydistillery.com. Fresh but gently spicy. Punchy but relatively low ABV. Rhubarb tartness and ginger warmth twine around each other in sticky harmony in your glass, in this dream after-dinner Christmas drink for port-shunners. £18 from Edinburgh Gin. For more information, visit www.edinburghgin.com. Stuff mince pies and carrots, it’s whisky that Santa gets sooty for. Yes, this pungent elixir is a patient tipple, loyally waiting for the bitterly cold nights to really set in before stealing the show. This year, it’s anCnoc’s Peatheart which our family will be toasting with on Christmas Eve. Matured in American oak casks, a dram of this warming whisky sees delicate hints of sweet apple and pear attempt to tame its intense smokiness. Finally, succumbing to an indulgent chocolatey finish…it’s basically Christmas in a glass. anCnoc Peatheart, £52, available from Master of Malt and The Whisky Exchange. For more info, visit www.ancnoc.com. Already dreading a predictable day of bad jokes, dry turkey and twice removed cousin catch ups? Fear not, a change is upon us. Say goodbye to your old school Christmas hamper, and hello to The Cheese Geek. This nifty cheese subscription service is the ultimate Christmas gift for serious cheese connoisseurs. One off boxes are available, but if you really like them, buy them a 12-month subscription to The Elvis, which includes 4-5 hand selected seasonal cheeses, delivered to their door each month, accompanied by tasting notes and score cards. With a no repeat guarantee, this really is the gift that just keeps giving (cheesy, I know). The Cheese Geek’s 12-month subscription to The Elvis box starts from £27.50pm. Visit www.thecheesegeek.com.